네가티브 톤과 포지티브 톤 반응 둘 다를 갖고, 중간량의 복사 에너지에 노출된 회절 영역에서 여백을 형성하는 포토레지스트 조성물이 개시되어 있다. Have both positive tone and negative-tone reaction, a photoresist composition for forming a margin at the diffraction area exposed to radiation of an intermediate amount is disclosed. 상기 레지스트 물질은 도우넛 모양을 인쇄하기 위해 사용될 수 있거나, 제 2 마스킹(masking) 단계가 적용되어 라인을 인쇄할 수 있다. The resist material may be used to print a donut shape, and a second masking (masking) step is applied may be able to print the line. 또한, 레티클(reticle)에서 그레이-등급 필터를 사용하여 보다 크거나 작은 구조물이 수득될 수 있어 보다 큰 영역의 중간 노출 영역을 생성한다. In addition, the gray at the reticle (reticle) - produces an intermediate exposure region of a larger area can be greater or less than the structures obtained by using a grade filter. 본 발명은 일반적으로 집적 회로(IC) 칩의 제작에 관한 것이고, 보다 상세하게, 포지티브 톤과 네가티브 톤 속성 둘 다를 포함하는 포토레지스트 물질에 관한 것이다. The present invention relates generally to integrated circuit (IC) relates to the production of the chip, and more particularly, to a photoresist material containing both positive tone and negative tone property. 반도체 장치의 제작은 장치 기판의 표면상에 컴퓨터 보조 디자인(CAD)에 의해 형성한 패턴을 정확히 복제할 수 있느냐에 따라 좌우된다. Production of a semiconductor device is dependent on whether to accurately replicate the pattern formed by the computer-aided design (CAD) on the surface of the device substrate. 전형적으로 복제 공정은 다양한 식각과 침적 공정에 의해 수행되는 리소그래피(lithography) 공정을 사용하여 실행한다. Typically a replication process is performed using a lithographic (lithography) processes performed by various etching and deposition processes. 리소그래피 공정의 한 유형인 포토리소그래피는 반도체 장치, 집적 광학기, 포토마스크 등의 제작에 사용된다. A kind of photolithography of the lithographic process is used in the production of semiconductor devices, integrated optics, photo-mask. 이러한 공정은 포토레지스트 또는 단순히 레지스트로 공지되어 있는, 빛에 노출될 경우 반응하는 물질의 층을 적용하고, 선택적으로 포토레지스트의 일부를 빛 또는 다른 이온화 방사선, 즉 자외선, 전자빔, X-선 등에 노출시켜 물질의 일부분의 용해도를 변화시키고, 레지스트를 테트라메틸암모늄 하이드록사이드(TMAH) 등의 염기성 현상 용액으로 세척함으로써 이를 현상하여, 층 중에서 미조사된 부분(네가티브 레지스트의 경우) 또는 조사된 부분(포지티브 레지스트의 경우)을 제거하는 것을 기본적으로 포함한다. This process is a photoresist or simply be exposed to light as is known in the resist and apply a layer of a reactive material, and optionally photo light or other ionizing radiation a portion of the resist, i.e., ultraviolet rays, electron beams, exposure to X- ray by using this phenomenon by changing the solubility of a portion of the material, washing the resist with a basic developer solution such as tetramethylammonium hydroxide (TMAH), non-irradiated portion from the layer (in the case of negative resists) or the irradiated portion ( basically it includes the removal of the case of positive resists). 통상의 포지티브와 네가티브 톤 포토레지스트는 레지스트가 다양한 준위의 화학 방사선에 노출될 경우 제 1 용해 속도로부터 제 2 용해 속도로의 단일 전이가 존재하는 용해 곡선을 갖는 것을 특징으로 한다. Conventional positive and negative tone photoresists are characterized by having a melting curve that the resist is a single transition to the second dissolution rate from a first rate of dissolution, if exposed to actinic radiation of a different level. 포지티브 레지스트의 경우, 초기에 미노출된 레지스트는 현상액에 불용성인 반면, 노출된 레지스트는 노출량이 한계치를 초과하여 증가하면 보다 가용성이 된다. For a positive resist, the resist minochul initially when, while insoluble in the developing solution, the exposed resist exposure amount is increased beyond the limit value is more soluble. 네가티브 레지스트의 경우, 초기에 미노출된 레지스트가 현상액에 가용성이고 노출된 영역이 불용성이 된다는 것을 제외하고 유사한 행태가 관찰된다. In the case of negative resist, the resist except that the the minochul initially soluble in the developer and the exposed areas insoluble, and that the similar behavior is observed. 노출된 레지스트 영역과 미노출된 레지스트 영역간의 이러한 상이한 용해도에 의해, 레지스트 필름에 패턴을 형성할 수 있다. By the exposed resist region and such different solubility of the inter-region minochul resist, it is possible to form a pattern on a resist film. 상기 패턴은 집적 회로 장치를 형성하기 위해 사용될 수 있고, 이는 현재 이들 장치의 제작시 중요한 성분이다. The pattern may be used to form an integrated circuit device, which is the key element during the production of the current of these devices. 이상적 상황에서는, 노출 장비는 방사선이 투명한 마스크 영역에 있는 레지스트 물질만을 조사하도록 하고, 이에 따라 라인과 여백에 대해 첨예한 테두리(edge)가 제공된다. In the ideal situation, the exposure equipment and to investigate only the resist material in the radiation-transparent mask region, whereby the sharp edge (edge) for the lines and margins are provided along. 그러나, 회절 패턴은 투명한 영역의 테두리에 형성되어 이들 영역에서 레지스트가 부분적으로 노출된다. However, the diffraction patterns are formed on the rim of the transparent areas in the resist these regions are partially exposed. 예를 들면, 1986년 2월 4일자로 바다미(Badami) 등에게 허여되고 본 발명의 양수인에 양도된 미국 특허 제 4,568,631호 등에 상기 현상에 대한 장점이 나타나 있고, 이 특허는 빛의 강도가 회절 효과에 의해 감소된 영역에서만 얇은 레지스트 라인을 생성하기 위해 포지티브 레지스트와 상 역전용 부가제를 사용함을 개시한다. For example, in February 1986 4 date sea US (Badami) or the like to be present, assigned to the assignee US Patent No. 4,568,631 No. of the invention issued, etc., and is advantageous for the symptoms appear, this patent is the intensity of the light diffracted only in the area reduced by the effect to produce a thin resist line discloses the use of the reversing portion and the positive-working resist. 그러나, 이 과정은 통상적인 포지티브와 네가티브 톤 용해 반응을 갖는 레지스트를 사용하고, 레티클 상의 테두리로부터 레지스트 상을 형성하기 위해 두가지 개별적인 노출과 현상 작업이 요구된다. However, this process are two separate exposure and processing operation is required using the resist having the conventional positive and negative-tone reaction and dissolved, to form a resist image from the rim on the reticle. 보다 높은 수준의 집적화가 산업 분야에 요구됨에 따라, 주어진 영역에서 보다 많은 수의 라인과 여백에 대한 요구가 매우 증가되어 왔다. Depending on the industry than the required high level of integration, there has been a greatly increased demand for a large number of lines and margins than in the given area. 이에 따라, 연구의 주요 주제는 회로 패턴의 가공(架空) 상을 향상시키기 위해 노출 장비와 레티클 시스템을 개선하는 것이었다. Accordingly, was to improve the exposure device and reticle system for the main subject of the study is to improve the processing (架空) of the circuit pattern. 집적 회로의 패턴 밀도를 개선시키기 위해, 예를 들면 상 전이 레티클, 보다 짧은 파장의 노출 장비, 보다 높은 수치 구경 노출 장비와 선택적 조명 시스템을 갖는 장비가 지속적으로 개발되고 있다. In order to improve the pattern density of the integrated circuit, for example, a phase transfer reticle, exposure device than the short wavelength, it is more a continuously developing equipment having a high numerical aperture exposure equipment and an optional lighting system. 높은 비용, 불량한 수율과 검사와 수리의 어려움에 의해 상 전이 레티클은 일반적으로 사용이 용이하지 않다. Phase transfer reticle is generally not easy to use due to high costs, poor yields and the difficulty of inspection and repair. 노출 장비 고안과 구성의 복잡성에 의해, 보다 높은 수치 구경과 보다 짧은 파장의 노출 시스템을 제작하는 것은 매우 비경제적이다. It is very expensive to by the complexity of the exposure equipment designed and configured, making a higher numerical aperture than the exposure system of the short wavelength. 또다른 활동 영역에서는, 포토레지스트의 콘트라스트(contrast)를 개선하기 위해 노력하였다. In a further active area, and in improving the contrast (contrast) of the photoresist. 그러나, 포토레지스트의 작동에 대한 기본 기작은 변하지 않고 있는 바, 즉 레지스트는 포지티브 또는 네가티브 톤 시스템으로서 작용한다. However, the basic mechanism for the operation of the photoresist bar, that is a resist which is unchanged, acts as a positive or negative tone system. 따라서, 신규한 장비와 레티클을 개발하지 않고도 통상의 광학 리소그래프를 보다 적은 크기의 구조물에까지 적용할 수 있도록, 레지스트 반응의 신규한 기작을 고안하는 것이 바람직하다. Thus, to the conventional optical lithography graph without the need to develop new equipment and a reticle, may be applied far more small-scale structure, it is desirable to devise a new mechanism of reaction of the resist. 또한, 이들 신규한 장비와 레티클이 마침내 개발되고 충족됨에 따라, 이들 신규한 레지스트에 의한 접근 방법은 리소그래피 수용력이 추가로 확장하는데 적용가능하게 될 것이다. In addition, as these novel devices and reticles is finally developed are met, these approaches due to a novel resist will be applied to extend to the added lithography capacity. 현재, 고성능 장치의 경우 레티클상의 상 크기를 조절하고 웨이퍼의 한 배치에서 다음 배치까지의 상 크기를 조절하는 것이 생성물 상의 상 크기 편차에 대해 가장 크게 기여한다. Currently, if a high-performance apparatus to adjust the image size on the reticle, and the most significant contribution to the size for the variation on the product to adjust the size of the next batch in a batch of wafers. 고성능 장치에서 칩 수율은 칩을 가로지르는 상 패턴의 균일성과 상 패턴을 정확한 치수로 중심을 맞추는 것에 따라 크게 좌우된다. In the high-performance device chip yield is highly dependent, as to match the center of the uniformity and the pattern of the pattern across the chip with the correct dimensions. 이들 제한 사항은 현재 레티클, 광학기, x-선, 근접 전자빔 등을 사용하는 리소그래피 패턴의 모든 유형에 존재한다. These limitations are present in all types of lithographic pattern using the current reticle optical group, x- ray, electron beam, such as close-up. 레티클을 가로지르는 상 균일성은 특히 1x 마스크를 사용하는 리소그래피 기법(예: x-선과 근접 전자빔 리소그래피)에서 특히 문제가 된다. A reticle across the uniformity in particular lithography technique using the mask 1x: is a particular problem (for example, x- line-up electron beam lithography). 따라서, 레티클상의 상 크기 조절과 무관하게, 상 크기에 대한 정확한 상 조절을 허용하는 포토레지스트 물질을 제공하는 것이 바람직하다. Therefore, it is desirable, regardless of the scale on the reticle, to provide a photoresist material that allows for the accurate adjustment of the image size. 본 발명의 바람직한 예시적인 실시태양은 이후 첨부된 도면과 연관되어 설명될 것이고, 도면들에서 동일 부호는 동일 요소를 나타낸다. A preferred illustrative embodiment of the invention will be described in connection with the accompanying drawings later, same reference numerals indicate the same elements in the figures. 도 1은 본 발명의 용도의 개략도이다. 1 is a schematic view of an application of the present invention. 도 2는 다양한 노출 에너지에서 표준 네가티브 레지스트의 제형의 초점(㎛)에 대해 도시된 라인 폭(㎚)의 그래프이다. 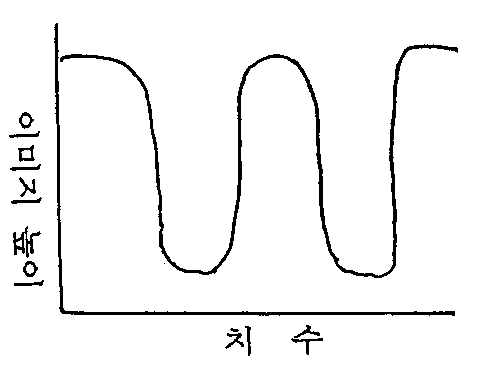 Figure 2 is a graph of the line width (㎚) shown for the focus (㎛) of the formulation of a standard negative resist at different exposure energies. 도 3은 다양한 노출 에너지에서 본 발명의 혼성 레지스트의 초점(㎛)에 대해 도시된 혼성 패턴의 네가티브 톤 라인의 라인 폭(㎛)의 그래프이다. Figure 3 is a graph of the line width (㎛) of the negative tone of the mixed-line pattern shown for the focus (㎛) of the hybrid resist of the present invention at different exposure energies. 도 4는 본 발명의 혼성 레지스트에 혼입된 포지티브 톤 용해도 억제제(MOP)의 양에 대해 도시된 라인 폭(㎚)을 나타내는 그래프이다. 4 is a graph showing a line width (㎚) plotted against the amount of the positive tone solubility inhibitor (MOP) incorporated in the hybrid resist of the present invention. 도 5는 표준 레지스트 제형과 본 발명의 혼성 레지스트 제형을 사용시의 라인 폭에 대한 초점 범위를 비교하는 모델이다. 5 is a model for comparing the focus range of the line width of the resist using a standard resist formulation and mixed formulations of the present invention. 도 6은 셀 영역과 장치의 발생(generation) 사이의 관계를 나타내는 그래프이다. Figure 6 is a graph showing the relationship between the occurrence of the cell area and the apparatus (generation). 도 7은 본 발명의 혼성 레지스트가 비트라인(bitline)을 형성하기 위해 사용될 수 있는 6 스퀘어 셀에 대한 샘플 배치도를 나타내는 칼라 개략도이다. Figure 7 is a schematic view showing the color sample arrangement on six square cells in which the hybrid resist of the present invention may be used to form the bit line (bitline). 도 8은 본 발명의 혼성 레지스트가 장치를 형성하기 위해 사용될 수 있는 4 스퀘어 셀에 대한 샘플 배치도를 나타내는 칼라 개략도이다. Figure 8 is a schematic view showing the color sample arrangement on the four square cells in which the hybrid resist of the present invention may be used to form the device. 도 9는 본 발명의 혼성 레지스트의 제형을 사용하여 노출량(mJ)의 함수로서 용해 속도(㎚/sec)를 나타내는 그래프이다. 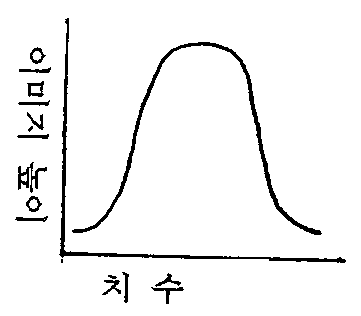 9 is a graph showing the dissolution rate (㎚ / sec) as a function of the exposure dose (mJ) by using the resist formulation of the hybrid of the present invention. 도 10은 본 발명의 혼성 레지스트의 제형을 사용하여 형성된 라인과 여백의 주사 전자 현미경도이다. 10 is a scanning electron micrograph of the margin line and formed by using the resist formulation of the hybrid of the present invention. 도 11은 본 발명의 혼성 레지스트의 제형을 사용하여 크롬 여백의 함수로서, 생성된 라인과 여백 폭을 나타내는 그래프이다. 11 is a graph showing a margin as a function of chromium, using the formulation of the hybrid resist of the present invention, the resulting lines and the margin width. 도 12는 노출량(mJ)의 함수로서 혼성 레지스트의 다른 대안적인 제형의 용해 속도(㎚/sec)을 나타내는 그래프이다. 12 is a graph showing the exposure amount (mJ) alternative dissolution rate of the formulations of the mixed resist as a function of (㎚ / sec). 도 13은 본 발명의 혼성 레지스트의 제형을 사용하여 MOP 적재량의 함수로서 여백 폭(㎛)의 편차를 나타내는 그래프이다. 13 is a graph showing the variation in the margin width (㎛) as a function of the loading of MOP with the formulation of the hybrid resist of the present invention. 도 14는 노출된(네가티브) 라인, 미노출된(포지티브) 라인과 여백 폭이 노출량의 함수로서 도시된, 본 발명의 혼성 레지스트의 제형의 반응에 대한 그래프이다. Figure 14 is a graph of the reaction of the formulation of, a hybrid resist of the present invention shown as a function of the line, minochul exposed (negative) (Positive) line and the exposure margin width. 도 15는 본 발명의 실시예 2에 기술된 바와 같은 혼성 레지스트 제형에 의해 0.5 수치 구경(numerical aperture: NA) 원자외선(deep ultra violet: DUV) 노출 장비상에 인쇄된 0.18㎛ 레지스트 라인과 여백의 주사 전자 현미경도이다. 15 is a 0.5 numerical aperture by a hybrid resist formulation, such as those described in the second embodiment of the present invention of:: (deep ultra violet DUV) printed on the exposed equipment 0.18㎛ resist lines and margins (numerical aperture NA) ultraviolet a scanning electron microscope, Fig. 따라서, 본 발명은 노출에 대해 포지티브 톤과 네가티브 톤 반응을 동시에 갖는 포토레지스트 물질을 제공한다. Thus, the present invention provides a photoresist material having a positive tone and negative-tone reaction for the exposure at the same time. 물질의 상기 조합은 레지스트의 신규한 유형을 제공할 수 있고, 본 발명자들은 이를 혼성(hybrid) 레지스트로 지칭한다. The combination of materials may provide a novel type of resist, the inventors refer to this as a hybrid (hybrid) resist. 혼성 레지스트가 화학 방사선에 노출될 경우, 고강도 방사선에 노출된 영역은 네가티브 톤 라인 상을 형성한다. If mixed-resist is exposed to actinic radiation, the areas exposed to high intensity radiation to form a negative tone line. 미노출된 영역은 현상액에 불용성이므로 포지티브 톤 라인 패턴을 형성한다. The minochul area is an insoluble in a developer to form a positive tone pattern line. 중간량의 강도에 노출된 영역, 예를 들면 회절 효과가 강도를 감소시키는 가공 상의 테두리는 현상 동안 레지스트 필름에 여백을 형성한다. Exposure to the strength of the intermediate region amount, for example, borders on the machining of a diffraction effect to decrease the strength to form the margin of the resist film during the development. 이러한 레지스트 반응은 본 발명의 레지스트가 가지는 독특한 용해 속도 특성이고, 여기서 미노출된 레지스트는 현상되지 않고, 부분적으로 노출된 레지스트는 고속으로 현상되고, 매우 노출된 레지스트는 현상되지 않는다. The resist response is unique dissolution rate characteristics with the resists of the invention, in which a resist minochul is not developed, in part, the resist is exposed and developed at a high speed, so does the exposed resist is not developed. 따라서, 혼성 포토레지스트의 독특한 용해 속도 반응에 의해 단일 가공 상이 통상의 레지스트에 의한 것처럼 단일 라인 또는 여백으로서가 아닌 여백/라인/여백의 조합으로 인쇄되도록 허용하는 것은 본 발명이 가지는 특징이다. Thus, it allows by the unique rate of dissolution reaction of the hybrid photoresist different single processed to print a single line or the margin Margin / line / the combination of the margin and not as as by a conventional resist having a feature of the present invention. "빈도를 2배로 하는" 상기 레지스트의 능력은 통상의 노출 시스템을 보다 높은 패턴 밀도에 적용할 수 있도록 허용한다. Ability of the resist "to the frequency doubled" allows to apply the conventional exposure system, a higher pattern density. 본 발명의 한 이점의 예는 0.2㎛ 이하의 라인과 여백이 0.35㎛ 해상도에서 작동하도록 고안된 통상의 원자외선(DUV) 리소그래피 장비에 의해 인쇄될 수 있다는 것이다. Examples of the advantages of the present invention is that it can be printed by a conventional source of ultraviolet (DUV) lithography equipment designed and the margin of the line to operate on more than 0.2㎛ 0.35㎛ resolution. 혼성 레지스트의 상기 유형의 다른 이점은, 노출량과 레티클 상 크기가 변화하여도 여백 폭이 일반적으로 변화되지 않는다는 것이다. A further advantage of this type of hybrid resist, will also do the margin width is typically not changed by the exposure, and the reticle image size variation. 이로써 하나의 웨이퍼 또는 배치(batch)가 다른 웨이퍼에 있는 칩이라도 각각의 칩 내의 여백 폭에 대한 매우 정밀한 상 조절이 가능하다는 것이다. Thus that it is a single wafer or batch (batch) is any chip in the other wafer can be very precise phase control over the margins in each of the chip. 본 발명의 또다른 이점은 혼성 레지스트가 가지는 빈도를 2배로 하는 능력으로 인해 최소 레티클 구조물 크기가 완화된다는 것이다. Another advantage of the present invention is that the minimum size of a reticle structure relaxation due to the ability to resist the frequency having the hybrid twice. 예를 들면 통상적 레지스트를 사용한다면 0.2㎛ 크기의 구조물을 인쇄하기 위해서는 일반적으로 0.2㎛ 크기의 레티클 상이 요구된다. For example, using the conventional resist in order to print the structure of 0.2㎛ size is generally required for different reticle 0.2㎛ size. 그러나 혼성 레지스트를 사용할 경우, 0.2㎛ 여백은 레티클 구조물의 단일 테두리에 의해 형성될 수 있는데, 예를 들면 0.5㎛ 레티클 개구는 두개의 0.2㎛ 여백과 하나의 0.2㎛ 라인을 생성시킬 수 있었다. However, with the hybrid resist, 0.2㎛ margins may be formed by a single edge of the reticle structure, e.g. 0.5㎛ reticle opening was able to create a two and one 0.2㎛ 0.2㎛ margin line. 이러한 방식으로, '감소' x-선 또는 전자빔 리소그래피가 달성될 수 있을 것이고, 레티클 상 피치(pitch)는 기판상에 인쇄된 피치의 대략 2배일 수 있다. In this way, the "reduction" x- ray or electron beam lithography will have to be accomplished, the reticle onto the pitch (pitch) may be approximately twice the pitch of the printing on the substrate. 이는 또한 광학적 레티클의 상 크기 요건을 완화시켜 비용을 줄이고 레티클의 수율을 개선시키는 추가의 이점을 갖는다. This also reduces the cost to mitigate the size requirements of the optical reticle has an additional benefit of improving the yield of the reticle. 본 발명의 이점의 하나는 0.2㎛ 이하의 라인과 여백이 현행 장비를 고치지 않고 달성될 수 있는 것이다. One advantage of the present invention and the line of the margin is less than 0.2㎛ that can be achieved without changing the current equipment. 본 발명의 추가의 이점은 노출량과 레티클 크기가 변화할 때 여백 폭이 일반적으로 변화하지 않고, 이로써 여백 폭의 조절에 대한 보다 큰 공정 관용도가 허용되는 것이다. A further advantage of the present invention is not the margin width generally change when the exposure with the reticle size variation, so that it is larger than the process latitude is allowed for the adjustment of the margin width. 본 발명의 혼성 레지스트를 사용함으로써, 레티클상의 상 치수에 대한 오차는 기판상에 인쇄된 여백 폭에서 재현되지 않는다. By using the hybrid resist of the present invention, the error of the dimensions on the reticle is not reproduced in the margin width printed on a substrate. 그 결과, 칩을 가로지르는 여백 폭의 편차가 최소화된다. As a result, the deviation of the blank space width is minimized across the chip. 이는 광학, x-선과 전자빔 노출 방법에 유용하다. Which it is useful for the optical, line x- electron beam exposure method. 특히 1x 레티클, 즉 일반적으로 기판상에 인쇄된 상과 1 대 1 관계를 갖는 레티클이 요구되는 리소그래피 기법에 유용한데, 이는 레티클상의 상 크기의 편차가 일반적으로 기판상에서 다시 발생하기 때문이다. In particular 1x reticle, that is generally used as a useful on printed on the substrate in a single lithographic techniques that require a reticle having a relationship, since the deviation of the size on the reticle typically occurs again on the substrate. 본 발명의 상술된 특징과 이점, 및 그 이외의 특징과 이점은 본 발명의 보다 바람직한 양태에 대한 하기의 보다 상세한 설명에 의해 명백해질 것이다. The above-described features and advantages, and those other than the features and advantages of the invention will be apparent from the more detailed description of the more preferred embodiment of the present invention. 본 발명은 노출에 대한 포지티브 톤과 네가티브 톤 반응 둘 다를 동시에 갖는 포토레지스트 물질을 제공한다. The present invention provides a photoresist material having at the same time both positive tone and negative tone response to exposure. 포지티브 톤 반응은 보다 낮은 노출량에서 우세한 반면, 네가티브 반응은 보다 높은 노출량에서 우세하다. While the positive tone reaction is dominant at lower exposure levels, negative reactions are dominant at higher dosages. 이러한 레지스트의 노출은 여백/라인/여백 조합을 산출하는 반면, 통상의 레지스트는 어느 형이든지 단지 단일 구조물을 생산한다. Whereas exposure of these resists is to calculate the margin / line / margin combination, a conventional resist In either type only produce a single structure. 하기 그래프에 나타낸 바와 같이, 포지티브 레지스트는 노출량이 증가함에 따라 용해도가 증가한다. As shown in the following graph, the positive resist is the solubility increases as the exposure amount increases. 이는 인쇄될 경우 하기와 같이 보이는 라인 패턴이 나타난다. This can be seen when the line pattern as in the case to be printed. 한편, 네가티브 레지스트 시스템에서, 노출된 영역은 하기 그래프에 나타낸 바와 같이 노출량이 증가함에 따라 용해도가 감소하게 된다. On the other hand, in the negative resist system, exposed area is the solubility decreases as the exposure amount is increased as shown in the following graph. 본 발명의 혼성 레지스트의 경우, 포지티브 톤 반응은 회절 효과가 노출 강도를 감소시키는 영역, 예를 들면 레티클 상의 테두리 부근의 영역에서 용해도의 감소를 일으킨다. For mixed-resist of the present invention, positive-tone reaction causes a diffraction effect is to reduce the exposed area intensity, for example, the solubility decreases in a region near the border on the reticle. 노출량이 증가할 때, 네가티브 톤 반응이 우세하여 보다 많이 노출된 영역에서 용해도가 감소한다. When the exposure amount is increased, to a negative-tone reaction predominantly decreases the solubility in the more exposed areas. 노출량의 함수로서의 레지스트 용해도의 결과 그래프는 하기와 같다. The solubility of the resist as a function of the exposure amount equal to the result of the graph. 이 경우 기판상에 레티클 라인 패턴을 인쇄하면 하기 여백/라인/여백 패턴이 나타난다. In this case, if printing a reticle line pattern on the substrate to display the margin / line / blank pattern. 이러한 방식으로, 가공 상은 표준 레지스트에 의해 수득될 수 있는 구조물의 수를 2배로 하는 "2배로된 빈도"로 된다. In this way, the processing phase is to "2 times the frequency", twice the number of structures that may be obtained by standard resist. 도 1은 포지티브 레지스트, 네가티브 레지스트와 혼성 레지스트 사이의 이러한 현저한 차이를 예시한다. Figure 1 illustrates such a significant difference between the positive-working resist, a negative resist and a hybrid resist. 빈도 2배의 혼성 레지스트는 전형적으로 현존하는 포지티브와 네가티브 톤 레지스트의 성분을 사용하여 제형화된다. Hybrid resist the frequency doubled is typically formulated by using the existing components of the positive and negative tone resists of. 이는, 예를 들면 산-감수성 용해도 억제 작용기, 가교-결합제, 광산 발생기(photoacid gererator), 임의로 염기 첨가제 와 감광제에 의해 부분적으로 개질된 폴리(하이드록시스티렌) 수지를 포함한다. This, for example, acid - and a binder, a photoacid generator (photoacid gererator), (hydroxy-hydroxy styrene), form a partially reformed by the additive and the base polyester resin photosensitizer-sensitive solubility inhibiting functional groups, cross-linking. 레지스트 제형은 최적 결과를 위해 신속한 포지티브 톤 반응과 느린 네가티브 톤 반응을 수득하도록 변화시킬 수 있다. Resist formulations may be varied so as to obtain a rapid reaction the positive tone and negative tone slow reaction for optimum results. 또한, 포지티브 톤 성분은 후노출 베이크(post expose bake) 온도에 비교적 불감성이도록 선택하고, 네가티브 톤 부분은 후노출 베이크 온도에 보다 감수성이 되도록 선택할 수도 있다. In addition, the positive tone component is selected to be relatively non-sensitivity to exposure baking (post expose bake) after the temperature, and negative-tone portions may also be selected to be more susceptible to post-exposure bake temperature. 이러한 방식으로, 포지티브와 네가티브 반응의 상대적 감수성은 베이크 온도에 의해 변형되어 목적하는 상 결과를 제공할 수 있다. In this manner, the relative sensitivity of the positive and negative reaction can provide the result desired is modified by the baking temperature. 추가로, 레지스트 제형은 상이한 치수의 여백 폭을 제공하기 위해 변형될 수 있다. In addition, the resist formulations can be modified to provide a wide margin of different dimensions. 예를 들면, 폴리(하이드록시스티렌) 수지상에 용해도 억제제의 양을 증가시킴에 따라 인쇄된 여백 폭은 보다 작아진다(도 13). For example, poly (hydroxystyrene), a margin width of the print in accordance with the increase of the amount of solubility inhibitor the resinous phase is less than (Fig. 13). 이러한 시도는 네가티브 톤 라인의 등초점 인쇄 바이어스를 변화시키기 위해 사용될 수 있는데, 포지티브 톤 용해도 억제제 농도가 높을 수록 네가티브 톤 라인의 등초점 인쇄 바이어스가 증가한다(도 4). And these attempts may be used to change the bias of the negative-tone printing deungcho point line, the higher the positive tone solubility inhibitor concentration increased deungcho printing bias point of the negative-tone lines (Fig. 4). 이는 인쇄된 네가티브 톤 라인의 크기를 감소시키고, 레지스트의 빈도 2배의 특성을 최적화시키는데 바람직하다. This is desirable to reduce the size of the printed negative-tone line, optimizing the characteristics of a frequency twice that of the resist. 혼성 레지스트의 포지티브와 네가티브 톤 기능의 상대적 반응은 또한 노출 조건을 개질시켜 변형될 수 있다. The positive and the relative response of the negative tone of the mixed resist also can be modified by modifying the exposure conditions. 예를 들면, 혼성 레지스트의 네가티브 톤 라인은, 통상적 레지스트의 행태와 유사하게, 노출량과 레티클 치수에 따라 달라진다. For example, the negative tone of the mixed-line resist, similar to the behavior of a conventional resist, dependent on the dosage and the reticle dimensions. 따라서, 예를 들면 노출량이 증가할 때 네가티브 톤 라인의 폭이 감소하고 여백은 동일 크기로 남아있지만, 여백은 네가티브 라인에 인접하여 위치되기 때문에 기판상의 새로운 위치로 전이된다. Thus, for example, the negative tone of the line width decreases when the exposure amount is increased, and the margin, but remains the same size, margin is transferred to the new location on the substrate because the position adjacent to the negative line. 유사하게, 포지티브 톤 라인은 노출량 또는 레티클 치수가 바뀜에 따라 크기가 변형될 수 있다. Similarly, a positive tone line is the size can be modified according to the changed exposure amount or a reticle dimension. 또다른 예로서, 두개의 레티클을 사용하여 두가지 별개의 패턴을 레지스트에 인쇄할 수 있다. As yet another example, it is possible to use two of the reticle to print two distinct patterns in the resist. 하나의 레티클을 높은 용량으로 노출시켜 혼성 작용이 레지스트에 표현될 수 있도록 한다. Exposing a reticle at a high capacity, so that the hybrid function can be expressed in the resist. 또다른 레티클은 동일한 레지스트 필름에 보다 낮은 용량으로 노출되어 포지티브 톤 기능만이 레지스트의 상기 부분에 표현될 수 있도록 한다. Another reticle is exposed to a lower dose to the same resist film, so that only the positive tone function can be represented on the part of the resist. 예를 들면 레티클이 보다 낮은 노출량이 요구되는 영역에서 화학 방사선의 부분적 필터를 함유할 경우, 이 효과는 단일 노출 공정에 의해 달성될 수 있다. For example, in the case contain a part of the filter actinic radiation in an area that requires a lower dosage than the reticle, the effect may be achieved by a single exposure step. 이는 보다 넓은 여백이 좁은 구조물과 동시에 인쇄될 수 있도록 허용하고, 이는 일부 장치 적용할때 필수적이다. This wider margin is allowed to be printed at the same time as the narrow structures, and it is essential to apply some devices. 상기 2단계 상 접근 방법을 변형하면, 표준 네가티브 톤 패턴을 생성하기 위해 혼성 레지스트를 사용할 수 있다. Deforming the second step the approach, it is possible to use a hybrid resist to produce a standard negative-tone pattern. 레지스트 필름을 표준 네가티브 톤 레티클에 의해 상-방향으로 노출시키고, 베이킹시켜 혼성 상을 형성하고, 이어서 화학 방사선에 의해 블랭킷(blancket) 노출시키고, 제 2 후노출 베이크 공정없이 현상될 경우 표준 네가티브 톤 상이 나타난다. A resist film-like by a standard negative-tone reticle-exposed in the direction of baking to form a mixed phase, was then blanket (blancket) exposed by the actinic radiation, the case be developed without the second post-exposure bake step standard negative tone different appear. 이러한 접근 방법이 요구되는 응용 분야가 있는데, 예를 들면 게이트 전도체 회로의 형성 같은 것이 있는데, 여기서는 매우 작은 라인이 인쇄될 필요가 있지만 고밀도의 상 피치가 필요하지는 않다. There are applications that require such an approach area, for example, there is such formation of the gate conductor circuit, in which the need is very small lines to be printed, but do not need a high-density pitch. 상기 방법에 대한 대안으로서, 상 방향 노출 후 베이킹 단계 전에 저용량의 화학선 에너지로 레지스트를 블랭킷 노출시킬 수 있다. As an alternative to the above method, a blanket may expose the resist to actinic energy of the low-capacity before the baking step after the exposure direction. 이 방법의 적합성은 용해도 억제 보호기가 수지상에 존재하는지의 여부와 포지티브 톤 반응이 온도에 의존하는지의 여부에 따라 좌우된다. The suitability of the method is dependent on whether or not and whether positive tone of the reaction that the protecting group present on the solubility inhibiting dendrite depends on the temperature. 그 같은 응용에서 혼성 레지스트를 사용하는 이점은 혼성 레지스트의 네가티브 톤 라인이 도 3에 도시된 바와 같이 이의 등초점에서 큰 인쇄 바이어스를 나타낼 수 있다는 것이다. The advantage of using a hybrid resist in such applications is that it can represent a large bias in the printed deungcho point thereof as shown in FIG. 3, the negative tone of the mixed-line resists. 다르게 말하면, 혼성 네가티브 톤 라인에 대한 가장 큰 공정 관용도에서, 레지스트 상 크기는 실질적으로 레티클 상 크기에 비해 작을 수 있다. In other words, the largest process latitude, resist image size for the mixed-line negative tone may be less than substantially the size of the reticle. 이는 가공 상이 보다 큰 레티클 크기에서 회절 효과에 의해 덜 손상되고, 이에 따라 도 2에 도시된 바와 같이 통상의 포지티브와 네가티브 톤 시스템에 의해 달성될 수 있는 것보다 큰 초점 깊이가 수득될 수 있으므로 바람직하다. This is preferable, and less damage by the diffraction effect in a large reticle greater than the different process, and therefore can be a conventional positive and greater depth of focus than can be achieved by a negative tone system obtained as shown in Figure 2, so . 상기 인쇄 바이어스는 크롬 라인의 테두리가 여백으로서 인쇄된다는 사실의 결과이다. The printing bias is a result of the fact that the edge of the chrome line that prints as blank. 사실, 여백은 가공 상의 테두리를 '정돈(trim)'하는 작용을 하여, 통상의 네가티브 레지스트에 비해 네가티브 라인을 보다 적게 인쇄한다. In fact, the margin to the effect that "trim (trim), the border on the processing, the printing less than a negative line, compared to a conventional negative resist. 이는 혼성 레지스트의 빈도 2배 특성을 보여주는 것이다. This shows the frequency characteristics of the double hybrid resist. 네가티브 톤 라인의 인쇄 바이어스를 최적화하도록 레지스트 제형을 고안할 수 있다. It can be designed to resist the formulation to optimize the bias of the negative-tone printing line. 예를 들면, 포지티브 톤 용해도 억제제에 대한 적합한 적재 인자를 선택함으로써 도 4에 도시된 바와 같이 특별한 인쇄 바이어스를 수득할 수 있다. For example, by selecting an appropriate load factor for the positive tone solubility inhibitor to obtain special printing bias as shown in FIG. 이론적으로, 다른 성분의 농도와 반응성을 적절히 변화시켜 포토레지스트에 유사한 변화를 줄 수 있다는 것도 명백하다. In theory, by appropriately changing the concentration and the reactivity of the other components it is obvious that it can give a similar change in the photoresist. 예를 들면, 우리는 DUV 0.5 NA 리소그래피 장비상에서 노출시킴으로써, 도 2와 도 3에 예시된 바와 같이 등초점 인쇄 바이어스가 표준 네가티브 톤 레지스트에 대한 등초점 인쇄 바이어스에 비해 0.11㎛ 클 수 있음(당해분야에 공지된 표준 계산을 데이터에 실행할 경우)을 밝혀내었다. For example, we 0.5 NA DUV lithography by exposing on the equipment, there is deungcho dots printed bias as illustrated in Figure 3 and Figure 2 may be greater than the 0.11㎛ deungcho printing bias point of the standard negative tone resist (the art If a known standard calculations to perform data) it revealed. 이러한 차이는 두 가지 방식으로 이용될 수 있다. These differences can be utilized in two ways. 한 접근법에서는, 초점과 노출 공정 관용도를 유지하면서 동일한 레티클 상 크기를 혼성 레지스트와 함께 사용하여 표준 레지스트에 비해 보다 적은 라인을 인쇄할 수 있었다. In one approach, while maintaining the focus and the exposure latitude of the process by using the same reticle, the size mixed with the resist was to print fewer lines than a standard resist. 또다른 사용 방식에서는, 레티클 구조물의 크기는 표준 레지스트에 비해 혼성 레지스트에 의해 증가될 수 있으면서도 표준 레지스트와 동일한 상 크기를 인쇄할 수 있다. In another usage, the size of the reticle structure has yet to be multiplied by the mixed-resist over the standard resist may be printed onto the same size as a standard resist. 보다 큰 레티클 상을 사용하면 도 5의 그래프에 도시된 바와 같이 감소된 회절 효과에 기인하여 보다 큰 초점 깊이가 제공된다. Due to the diffraction effect decreases as shown on the lower graph of Figure 5 using a larger reticle is provided with a larger depth of focus. 전자의 적용시는, 보다 작은 크기의 혼성 레지스트에 의해 보다 높은 성능이 달성된다. When the former is applied, a higher performance is achieved by the hybrid resist of a smaller size. 후자의 적용시, 혼성 레지스트의 보다 큰 공정 관용도 덕택에 높은 수율이 달성된다. This high yield is achieved, thanks to the latter at the time of application, greater process tolerance of the mixed resist also. 레지스트 제형은 최적 결과를 위해 높은 광속도 포지티브 톤 반응과 낮은 광속도 네가티브 톤 반응을 수득하도록 변화시킬 수 있다. Resist formulations may be varied so as to obtain a high speed of light positive tone response and low speed of light negative-tone reaction for optimum results. 또한, 포지티브 톤 레지스트는 후노출 베이크(PEB) 조건에 불감성이도록 선택되어 네가티브 톤 기능에 대한 포지티브 톤의 감수성의 비가 변형될 수 있도록 하여, 이에 따라 여백/라인/여백 조합의 비율이 변화될 수 있도록 할 수 있다. In addition, a positive tone resist is selected to be non-sensitivity to exposure bake (PEB) conditions, and then to ensure that the sensitivity of the positive tone to negative tone ratio is modified, so that the margin / line / the proportion of the margin combination can be varied It can help. 여백/라인/여백 비를 변화시키는 또다른 선택사항은 노출 장비의 레티클에 그레이-등급(gray-scale) 필터를 사용하는 것이다. Another option to change the margin / line / non-margin information, gray to the reticle of the exposure equipment - to use a grade (gray-scale) filter. 그레이-등급 필터는 방사선의 일부가 단지 레티클을 통과하도록 허용하여 중간 노출된 영역을 생성한다. Gray-grade filter to allow only a part of the radiation to pass through a reticle to generate the intermediate exposed areas. 이는 네가티브 톤 레지스트 기능이 이들 영역에서 작동되는 것을 방지하는데, 이는 노출량이 임계점에 도달되지 않지만, 포지티브 기능이 발생될 수 있도록 허용하는 까닭에, 보다 넓은 여백이 생성된다. This is to prevent the negative-tone resist feature to work in these areas, which is not exposure amount reaches the threshold, whereas that allows the positive features can be generated, is generated, a larger margin. 이는 보다 넓은 여백이 좁은 구조물과 동시에 인쇄될 수 있도록 허용하고, 이는 일부 장치에 적용할 때 필수적이다. This allows it to be printed at the same time, a larger margin and narrow structures, and it is necessary to apply to all devices. 추가의 가공 정제시, 전형적으로 수득되는 도우넛 모양의 구조물은 이들이 바람직하지 않을 경우 제 2 마스킹 단계에 의해 정돈될 수 있다. Donut-shaped structure that is added during processing Tablets typically is obtained in the first may be trimmed by the second masking step, if they are not preferred. 환형 또는 장방형 도우넛-모양의 트렌치(trench)가 다이내믹 랜덤 액세스(dynamic random access memory: DRAM)중 깊은 트렌치 커패시터(capcitor)와 1 기가바이트(GB) DRAM의 제 1 준위 배선(wiring)에 바람직하지만, 라인은 비트라인과 워드라인의 4 스퀘어(4SQ)와 6 스퀘어(6SQ) 배선에서 필수적이다. Circular or rectangular donut-trench shape (trench) is a dynamic random access: preferably the (dynamic random access memory DRAM) deep trench capacitor (capcitor) and 1 gigabyte (GB) of the first level interconnection (wiring) of the DRAM of but line is essential in four square (4SQ) and 6 square (6SQ) wiring of the bit line and word line. 도 6에 도시된 바와 같이, 발생당 셀 영역에서의 경향은 전형적인 8 스퀘어(8 SQ) 라인이 1GB 또는 그 이상의 밀도를 가지는 장치에 요구되는 면적 요건을 충족시키지 못할 것임을 보여준다. As shown in Figure 6, the trend in the cell area per occurrence shows that typical eight square (SQ 8) line does not meet the area requirement required for 1GB or device having a higher density. 이러한 이유로, 지그재그형 비트라인 등의 장치 설계의 변화가 제안되었다. For this reason, the change in device design, such as a staggered bit line has been proposed. 그러나, 본 발명에 개시된 바와 같이 신뢰성 있는 서브-리소그래피 구조물에 의해, 칩의 절첩된 비트라인 구조가 가능할 것이다. However, the sub-credibility as disclosed in the present invention by a lithographic structure, it will be a folded bit line structure of the chip. 또한, 장치 설계가 추가로 개선된다면, 구조물 크기를 감소시키는 능력은 장치 전체 성능과 크기를 향상시킬 수 있다. In addition, if the device capability of the design is further improved, thereby reducing the size of the structure is to improve the overall performance and the apparatus size. 도 7에 도시된 바와 같이, 6SQ 적층 커패시터 절첩 비트라인 구조가 제공되는데, 여기서 적절한 연결을 위해 요구되는 바와 같이, 비트라인의 피치는 1.5F이다. As it is shown in Figure 7, the pitch of the bit line, as there is provided a stacked capacitor 6SQ folded bit line structure, which is required for proper connection here is 1.5F. 비트라인의 피치를 1.0F로 감소시키고, 수직 방향으로 얕은 트렌치 고립(shallow trench isolation: STI) 준위의 폭을 감소시킴으로써, 도 8에 도시된 바와 같이 4SQ 적층 커패시터 절첩 비트라인 구조는 현재의 기법에 의해 수득될 수 있다. And decreasing the pitch of the bit lines to 1.0F, a shallow trench isolated in the vertical direction (shallow trench isolation: STI) 4SQ stacked capacitors folded bit line structure, as by reducing the width of the level, as shown in Figure 8 with the current techniques by it can be obtained. 4SQ에 있어서, y-방향의 적층된 커패시터 또한 본 발명의 혼성 레지스트를 사용하여 한정되어야 할 것이다. In 4SQ, the stacked capacitor of the y- direction will also be limited by using the hybrid resist of the present invention. 하기 실시예는 빈도 2배의 레지스트 조성물의 예이지만, 이는 제한적인 것이 아니며, 당해 분야의 숙련가라면 많은 변형을 할 수 있음이 명백하다. The following examples are but examples of the resist compositions of the frequency doubled, this is not restrictive, and it is obvious that to the skilled garamyeon many variations in the art. 본 발명에 따라 사용하기에 적합한 포토레지스트 수지는 포토레지스트 제형에 중합체 수지로서 사용하기에 적합한 모든 염기-가용성, 장쇄 중합체를 포함한다. Photoresist resins suitable for use according to the invention are all suitable for use as a base polymer resin in the photoresist formulations - and a soluble, long-chain polymer. 특정 예로는 (i) -OH기를 갖는 방향족 중합체, 예를 들면 폴리(4-하이드록시스티렌), 폴리(3-하이드록시스티렌)[텍사스주 코푸스 크리스티 소재의 훽스트 셀라니즈(Hoechst Celanese)로부터 구입가능] 등의 폴리하이드록시스티렌, 노볼락 수지[매사추세츠 말보로 소재의 시플레이(Shipley)로부터 구입가능], 페놀계 -OH기를 갖는 중합체(예: 페놀 포름알데히드 수지) 등, (ii) 예를 들면 에스테르 측쇄를 갖는 폴리메타크릴산과 같은 산 그룹을 갖는 중합체, (iii) 아크릴아미드 그룹 유형의 중합체가 있다. 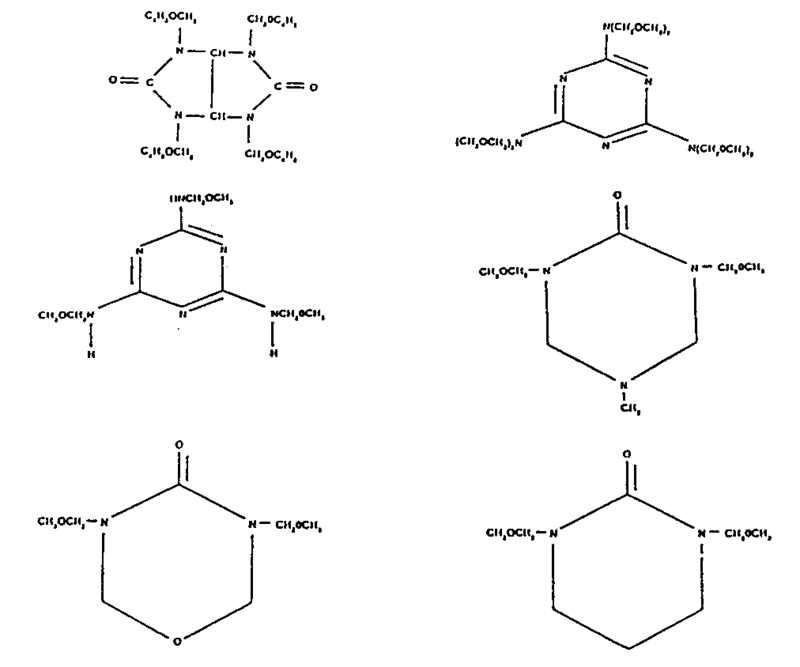 Obtained from specific examples include (i) aromatic polymers, such as poly (4-hydroxystyrene), poly (3-hydroxystyrene) [Texas Corpus Christi Hoechst Celanese of material (Hoechst Celanese) having -OH group available] polyhydroxystyrene, novolac resins [polymers having Massachusetts during play (Shipley) groups buying enabled, phenolic -OH from Marlborough materials, such as (for example phenol formaldehyde resin), etc., (ii) e.g. there is a polymer, (iii) acrylamide type groups having an acid group, such as polymethacrylic acid polymer having an ester side chain. 탈보호된 형태 중합체 수지는, 즉 일단 포지티브 톤 반응이 일어나서 염기 가용성이고 현상 용액, 예를 들면 금속-비함유 수산화나트륨, 테트라메틸암모늄 하이드록사이드, 테트라에틸 암모늄 하이드록사이드, 금속 함유 수산화칼륨, 소듐 메타실리케이트의 수용액과 혼화성이다. De-protected form of the polymer resin, that is, once the positive tone reaction got up base soluble and the developing solution, for example, metal-free sodium hydroxide, tetramethylammonium hydroxide, tetraethylammonium hydroxide, metal containing potassium hydroxide, sodium meta an aqueous solution and the compatibility of the silicate. 바람직한 중합체 수지는 현상 용액에서의 용해도를 증진시키기 위해 약 1,000 달톤 내지 약 250,000 달톤, 가장 바람직하게는 약 1,000 내지 25,000달톤의 범위내의 평균 분자량을 갖는다. Preferred polymer resins is from about 1,000 Daltons to about 250,000 Daltons, and most preferably to promote the solubility in the developing solution has a number average molecular weight in the range of about 1,000 to 25,000 Daltons. 예를 들면 p-하이드록시스티렌-말레산 무수물 공중합체, 폴리하이드록시스티렌-p-3급 부틸-카르가나토스티렌 공중합체, 폴리(2-하이드록시스티렌), 페놀-포름알데히드 수지, 폴리메틸 메타크릴레이트-3급 부틸 메타크릴레이트-폴리메타크릴산 삼원중합체, 폴리-4-하이드록시스티렌-3급 부틸 메타크릴레이트 공중합체, 방향족 환상에 하나 이상의 산 불안정한 알킬 또는 아릴 치환체를 갖는 폴리(4-하이드록시스티렌), 또는 이들중 임의의 것이 대다수의 서브유닛으로 존재하는 공중합체, 예로써 뉴욕주 뉴역 소재의 마루젠 아메리카(Maruzen America)에서 시판하는 PHM-C 등이 포함된다. For example, p- hydroxystyrene-maleic anhydride copolymer, polyhydroxystyrene -p-3-butyl-carbamic NATO styrene copolymer, poly (2-hydroxystyrene), phenol-formaldehyde resins, polymethyl methacrylate tert-butyl methacrylate-polymethyl methacrylate terpolymer, poly-4-hydroxystyrene-tert-butyl methacrylate copolymers, having at least one acid labile alkyl or aryl substituents to the aromatic cyclic ( as 4-hydroxystyrene), or copolymers, for example, any of those present in a majority of the subunit, and the like PHM-C, available from Maruzen America (Maruzen America) of NY nyuyeok material. PHM-C는 두가지 폴리(하이드록시스티렌) 서브유닛과 비닐 사이클로헥사놀 서브유닛을 바람직하게 약 99: 1 내지 약 50:50의 범위로 포함한다. PHM-C are two poly (hydroxystyrene) sub-unit and a vinyl-cyclohexadiene play subunit preferably about 99 to: comprises in the range of 1 to about 50: 50. 가장 바람직한 비는 약 90:10의 폴리(하이드록시스티렌) 유닛: 비닐 사이클로헥사놀 서브유닛이다. 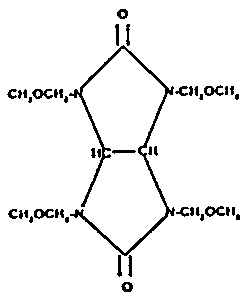 The most preferred ratio of about 90: 10 poly (hydroxystyrene) units: a vinyl-cyclo-hexanol subunit. 뿐만 아니라 에테르화된 아미노 수지, 예로써 메틸화되거나 부틸화된 멜라민 수지인 N-메톡시메틸- 또는 N-부톡시메틸-멜라민, 또는 하기 구조식의 메틸레이트/부틸레이트 글리콜-우릴을 포함하는데 이는 캐나다 특허 제 1 204 547호에 개시되어 있다. As well as etherified amino resins, for example the methylation or the butylated melamine resin, N- methoxymethyl-or N- butoxymethyl-methyl acrylate / melamine, or the following structural formula butyrate glycol-lauryl which includes a Canadian It disclosed in Patent No. 1 204 547. 광산 발생기("PAG")는, 이에 제한되는 것은 아니지만, N-(트리플루오로메틸술포닐옥시)-비사이클로[2.2.1]헵트-5-엔-2,3-디카복스이미드(&quot;MDT"), 오늄염, 방향족 디아조늄염, 술포늄염, 디아릴요도늄 염과 N-하이드록시아미드 또는 -이미드의 술폰산 에스테르가 포함되고, 이는 본원에 참고로 인용된 미국 특허 제 4,731,605호에 개시된 바와 같다. 또한, N-하이드록시-나프탈이미드("DDSN")의 도데칸 술포네이트 등의 보다 약한 산을 생산하는 PAG가 사용될 수 있다. Photoacid generators ( "PAG") include, but are not limited to, N- (methylsulfonyl trifluoromethyl sulfonyl oxy) bicyclo [2.2.1] hept-5-ene-2,3-dicarboxylic imide bokseuyi (& quot; already containing the sulfonic acid ester of a de, which is U.S. Patent No. 4,731,605, incorporated herein by reference No. - MDT "), onium salts, aromatic diazonium salts, sulfonium salts, diaryl iodonium salts and the N- hydroxyamide or also as disclosed, N- hydroxy-naphthalimide can be used in the PAG to produce a weak acid such as dodecane sulfonate than the imide ( "DDSN"). 가능한 염기 첨가제로는, 이에 제한되는 것은 아니지만, 디메틸아미노 피리딘, 7-디에틸아미노-4-메틸 쿠마린("쿠마린 1"), 3급 아민, 양성자 스폰지, 베르베린, BASF로부터 "플루로닉(Pluronic)" 또는 "테트로닉(Tetronic)" 시리즈로서 시판되는 것과 같은 중합체성 아민이 있다. Possible base additives include, but are not limited to, dimethylaminopyridine, 7-diethylamino-4-methyl coumarin ( "coumarin-1"), a tertiary amine, proton sponge, berberine, from BASF as "Pluronic (Pluronic ) "and" Tetronic (Tetronic) "there is a polymeric amine, such as that commercially available as series. 또한 PAG가 오늄염일 경우 테트라 알킬 암모늄 하이드록사이드 또는 세틸트리메틸 암모늄 하이드록사이드가 사용될 수 있다. Also, the PAG is a tetraalkylammonium hydroxide or cetyltrimethylammonium hydroxide may be used if an onium salt. 사용될 수 있는 증감체의 예로는 크리센, 피렌, 플루오란텐, 안트론, 벤조페논, 티옥산톤, 9-안트라센 메탄올(9-AM) 등의 안트라센이 있다. Examples of the sensitizer material which can be used is the anthracene such as chrysene, pyrene, 9-anthracene methanol fluoran X, anthrone, benzophenone, thioxanthone, (9-AM). 추가의 안트라센 유도체 증감체는 본원에 참고로 인용된 미국 특허 제 4,371,605호에 개시되어 있다. The addition of anthracene derivatives sensitized body are disclosed in U.S. Patent No. 4,371,605, incorporated herein by reference. 증감체는 산소 또는 황을 포함할 수 있다. Sensitized material may include a nitrogen, oxygen or sulfur. 증감체는 질소가 없는 것이 바람직한데, 이는 질소의 존재, 예로써 아민 또는 페노티아진 기 등은 노출 공정시 발생된 유리 산을 격리시키는 경향이 있고, 제형은 감광도를 손실하게 된다. Sensitized material is preferred that does not have a nitrogen, which is the presence of nitrogen, such as amines or phenothiazine group, and the like tends to isolate the free acid generated during the exposure step, the formulation is loss of sensitivity. 층이 너무 두껍거나 얇지 않게 조성물을 기판에 적용시킬 수 있도록 주형 용매를 사용하여 전체 조성물의 적절한 경점성을 제공할 수 있다. The solvent layer is used for the mold to be not too thick or thin, applying the composition to the substrate can provide an appropriate, the viscosity of the total composition. 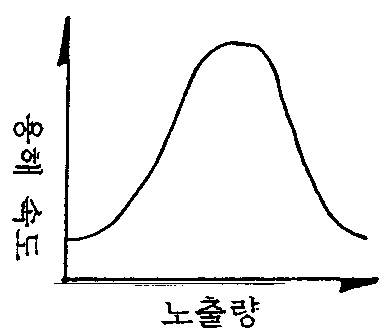 샘플 주형 용매로는 에톡시에틸프로피오네이트("EEP"), EEP와 γ-부티로락톤("GBL")의 조합물, 프로필렌-글리콜모노에틸에테르 아세테이트(PM 아세테이트)가 있다. A glycol monomethyl ether acetate (PM acetate) sample template solvents include ethoxyethyl propionate ( "EEP"), the combination of propylene of EEP and γ- butyrolactone ( "GBL"). 하기 실시예에서는, 이들중 각각 하나가 선택되었지만, 많은 조성물이 레지스트의 다양한 부분을 위해 선택될 수 있고, 본 발명의 기본은 혼성 레지스트가 네가티브 톤 성분과 포지티브 톤 성분으로 구성되고, 이때 포지티브 톤 성분은 제 1 화학선 에너지 준위에서 작용하고, 네가티브 톤 성분은 제 2 화학선 에너지 준위에서 작용하며, 제 1과 제 2 화학선 에너지 준위는 화학선 에너지 준위의 중간 범위에 의해 분리된다는 사실에 있음을 인식해야 한다. The following Examples in each of them but one is selected, there are many compositions may be selected for different portions of the resist, and the base of the present invention is the hybrid resist composed of a negative tone component and a positive tone component, wherein a positive tone component is that the fact that the action, negative tone component acts in a second actinic energy level, the first and second actinic energy level is separated by a mid-range of the actinic energy level at a first actinic energy level it should be recognized. 7-디에틸아미노-4-메틸 쿠마린 염료(쿠마린 1) (알드리치 케미칼 캄파니(Aldrich Chemical Company)에서 입수함), 고형분의 0.1%. 7-diethylamino-4-methyl coumarin dye (Coumarin-1) (also available from Aldrich Chemical Company (Aldrich Chemical Company)), 0.1% of solid content. 용액을 0.2㎛ 필터를 통해 여과하였다. The solution is filtered through a filter 0.2㎛. 헥사메틸-디실라잔으로 하도된 실리콘 웨이퍼상에 용액을 피복시키고, 110℃의 소프트 베이크를 실시하여 나노스펙(Nanospec) 반사 분광광도계로 측정한 결과 약 0.8㎛ 두께의 필름을 얻었다. Hexamethyl-di-coating the solution onto a silicon wafer with primer silazane and, subjected to a soft bake of 110 ℃ nano spec (Nanospec) was measured with a reflective spectrophotometer to obtain a film having a thickness of about 0.8㎛. 이어서 저용량으로부터 고용량까지의 상이한 용량의 매트릭스를 갖는 0.37 수치 구경(NA) 캐논 스테퍼(Cannon stepper)에서 파장이 248㎚인 원자외선(DUV) 엑시머 레이저 방사선으로 피복된 웨이퍼를 노출시키고, 110℃에서 90초동안 후노출 베이킹(PEB)하였다. It was then exposed to a 0.37 numerical aperture (NA) stepper Cannon (Cannon stepper) having a wavelength of 248㎚ the deep ultraviolet (DUV) of the wafer coated with an excimer laser radiation having a matrix of a different capacity from the capacity to low capacity, from 110 ℃ 90 second it was exposed baked (PEB) after a while. 노출된 필름의 용해 속도는 주어진 시간 동안 0.14N 테트라메틸암모늄 하이드록사이드(TMAH) 현상액으로 현상한 후 남아 있는 필름의 두께로부터 계산되었다. The dissolution rate of the exposed film was calculated from the thickness of the film remaining after the development with a 0.14N tetramethyl ammonium hydroxide (TMAH) developer for a given time. 용액 속도 대 노출량의 관계는 도 9에 도시되어 있다. Relationship is illustrated in Figure 9 of the solution rate versus exposure dose. 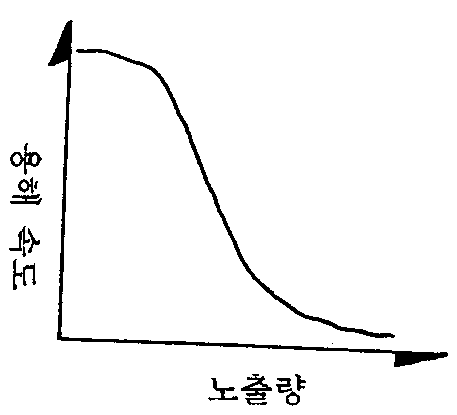 도 9에 도시된 바와 같이, 레지스트는 노출되지 않을경우 매우 낮은 용해 속도(약 2㎚/초)를 나타내었다. 9, the resist is shown when not exposed to a very low dissolution rate (approximately 2㎚ / second). 용량이 증가됨에 따라, 용해 속도는 약 50㎚/초에 도달될 때까지 증가한다. Depending on the capacity is increased, the dissolution rate is increased until it reaches approximately 50㎚ / second. 용해 속도는 약 1mJ 내지 약 3mJ의 용량 범위에서 비교적 일정하게 상기 수준으로 유지된다. The dissolution rate is kept relatively constant at a dose range of from about 1mJ to about 3mJ to the level. 용량을 더 증가시키면, 네가티브 가교결합 화학이 우세하게 되어 용해 속도는 0에 가까운 값으로 떨어진다. When further increasing the capacity, the negative cross-linking chemical is predominantly the dissolution rate is dropped to a value close to zero. 상기 레지스트의 전형적인 리소그래피 반응은 도 10에 예시되어 있는데, 이는 0.37NA를 갖는 248 DUV 스테퍼에 의해 2㎛의 피치에서 1㎛ 폭의 차례차례 배열된 크롬 라인을 갖는 마스크를 통해 레지스트를 노출시킨 결과를 도시한다. A typical lithographic reaction of the resist is illustrated in Figure 10, which is the result of exposing the resist through a mask having a time width of 1㎛ turn arranged chrome line in 2㎛ the pitch by 248 DUV stepper having a 0.37NA It is shown. 마스크에 있는 모든 크롬 라인과 여백 조합은 레지스트상에 약 0.8㎛의 네가티브 라인, 약 0.6㎛의 포지티브 톤 라인과 약 0.3㎛의 두개의 동일한 여백으로된 두개의 라인과 두개의 여백으로서 인쇄된다. All chrome lines on the mask and the margins of the combination is about 0.8㎛ negative line on the resist is a positive tone printing line and the two lines with the same margin of about two 0.3㎛ and two margin of about 0.6㎛. 동일한 레지스트에 의한 또다른 실험에서, 고립된 크롬 여백을 혼성 레지스트 필름상에 노출시키기 위해 MICRASCAN II 0.5NA DUV 스테퍼를 사용할 경우, 크롬 여백의 폭의 함수로서 여백/라인/여백 측정이 도 11에 나타난 바와 같이 도시된다. In another experiment by the same resist, and the isolated chromium margins when using the MICRASCAN II 0.5NA DUV stepper to expose resist on a hybrid film, as a function of the chromium margins shown in the margin / line / margin measurement is 11 as it is shown. 데이터에 따르면, 비록 라인의 폭이 마스크상의 크롬 여백의 폭에 상응하여 증가하지만, 라인의 어느 한 쪽 측부상의 여백은 비교적 일정하게 남아 있음을 알 수 있다. According to the data, although the increase of the line width corresponding to the width of the chrome on the mask blank, but any margin of one side of the line, it can be seen that remains relatively constant. 본 실시예는, 광산 발생기의 유형과 다양한 성분의 상대적인 량을 변화시키면 혼성 레지스트의 용해 속도 특성을 변화시킬 수 있고 이어서 리소그래피 반응을 변화시킬 수 있는 방식을 예시한다. This embodiment, by changing the relative amounts of the various types of components of the photoacid generator may change the dissolution rate properties of the hybrid resist, and then illustrates the manner that can change the lithographic reaction. 제 2 제형을 제조하고, 실시예 1과 유사한 방식으로 진행하는데, 다만 하기 성분을 포함한다. The proceeds in a similar manner as in Example 1 to prepare a second dosage form, and, just containing the following components. 18.9% 고형분 용액을 형성하기 위해, 용매로서 350ppm FC-430 계면활성제를 함유하는 충분한 량의 PM 아세테이트. 18.9% to form a solid solution, a sufficient amount of PM acetate containing 350ppm FC-430 surfactant as the solvent. 생성된 혼성 레지스트의 용해 속도 특성은 도 12에 나타나 있다. The dissolution rate properties of the resulting mixed-resist is shown in FIG. 곡선의 전체 특징은, 용해 속도가 미노출된 레지스트의 경우 낮게 출발하여 약 5mJ에서 높아지고, 7mJ을 초과할 때 감소한다는 점에서 실시예 1의 혼성 레지스트에 의해 제시된 것과 유사하다. 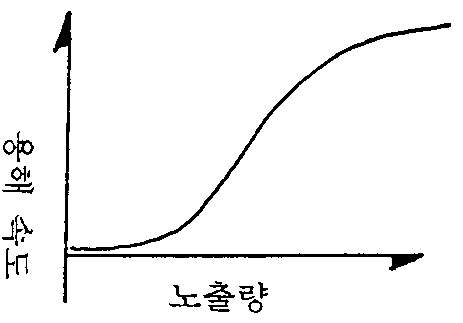 Total features of the curve, is similar to the dissolution rate for the resist minochul starting low higher at about 5mJ, presented by the hybrid resist of the first embodiment in that it decreases when exceeding 7mJ. 그러나, 절대 용량 범위와 이 범위내에서 용해 속도는 도 9에 도시된 바와 같이 매우 상이하다. However, in the absolute dose range and the range is the dissolution rate is very different, as illustrated in FIG. 도 14는 MICRASCAN II DUV 0.5 NA 스테퍼 장비에서 차례로 배열된 크롬 라인 마스크와 동일한 폭의 여백을 통해 노출될 경우 혼성 레지스트의 제형의 반응을 나타낸다. 14 is a case to be exposed through the margin of the same width as the mask chrome lines arranged one after the other in MICRASCAN II 0.5 NA DUV stepper equipment shows the reaction of the formulation of the hybrid resist. 네가티브 라인, 미노출된(포지티브) 라인과 여백 폭을 마스크 치수의 함수로서 도시되었다. It is shown a negative line, minochul the (positive) and the line width of the margin as a function of the mask dimensions. 여백은 0.18㎛의 범위에서 비교적 일정하게 유지되는 반면, 두 선은 마스크 치수가 달라짐에 따라 변한다. Margin while maintaining relatively constant in the range of 0.18㎛, the two lines changes according to the mask dimension varies. 이들 제형과 공정에 의한 레지스트 상의 대표적인 예가 도 15에 나타나 있다. A representative example on the resist by these formulations and the processes shown in Fig. 본 실시예는 빈도가 2배로 된 상의 여백 폭이 MOP에 의한 PHS의 다양한 보호 수준에 따라 변화될 수 있음을 예시한다. This example illustrates that the frequency of the margin on the width of the second fold can be varied according to various levels of protection according to the MOP PHS. 24%와 15% MOP 적재량을 갖는 두가지 상이한 PHS 각각은, 약 0.5㎛의 필름 두께를 수득하기 위해, 총 고형분 함량이 전체의 16.0%로 조정됨을 제외하고, 실시예 1의 제형과 동일한 혼성 제형을 제조하기 위해 사용되었다. 24% and 15% respectively, in two different PHS with MOP loading is about the same 0.5㎛ mixed formulation and formulation of Example 1 to obtain a film thickness, except that the total solid content is adjusted to 16% of the total, It was used to manufacture. 이들 두가지 소재의 제형으로부터, 15 내지 24% 범위의 평균 MOP 준위를 갖는 몇몇 다른 제형을 제조하였다. From the formulations of these two materials, it was prepared in several different formulations, having an average MOP levels of 15 to 24% range. 웨이퍼를 피복하고, 110℃ 소프트 베이킹하고, MICRASCAN II DUV 0.5NA 스테퍼 상에서 노출시키고, 110℃에서 60초 동안 후노출 베이킹하고, 최종적으로 0.14N TMAH 현상액으로 현상하였다. Covering the wafer, soft baking and 110 ℃, MICRASCAN II DUV 0.5NA and exposed on a stepper and exposure after baking at 110 for ℃ 60 seconds, and finally developed in 0.14N TMAH developer. 고립된 크롬 개구를 갖는 레티클을 혼성 레지스트 필름내에서 인쇄하였다. The reticle having an isolated chrome opening was printed in the hybrid resist film. 레지스트 상의 여백 폭을 측정하고, 각각의 제형을 제조하기 위해 사용되는 PHS중 평균 MOP 용해도 억제제 적재량의 함수로서 도시하였다. Measuring the width of the margin on the resist, which was shown as a function of the average MOP solubility inhibitor loading of the PHS is used to prepare each formulation. 도 13에 도시된 바와 같이 여백 폭은 MOP 농도에 매우 의존적임을 밝혀내었다. The margin width as illustrated in Figure 13 revealed that highly dependent on the concentration of MOP. PEB 후 현상 전에 블랭킷 DUV 노출을 사용하여 네가티브 톤 상화를 본 발명의 혼성 레지스트에 의해 수행할 수 있다. A negative tone DUV preconditioning using the blanket exposure before PEB after the development can be carried out by the hybrid resist of the present invention. 실시예 2에 기술된 바와 같이 혼성 레지스트 제형을 0.5NA DUV 노출 시스템 상에서 전기적 시험 패턴을 갖는 크롬 레티클로 상-방향으로 노출시켰다. Example 2 onto the hybrid resist formulation as described in a chrome reticle having a test pattern on the electrically 0.5NA DUV exposure system to expose the direction. 2000옹스트롬(Å)의 폴리실리콘 필름을 갖는 실리콘 웨이퍼(200㎜)를 기판으로 사용하여 생성된 레지스트 상의 식각된 패턴을 전기적 탐침 기법에 의해 측정할 수 있었다. The etched pattern on a resist film produced using a silicon wafer (200㎜) having a polysilicon film of 2000 angstroms (Å) with the substrate could be measured by an electrical probe techniques. 후노출 베이크 공정후, 웨이퍼를 노출 장비(MICRASCAN II)로 역순환시키고, 10mJ/㎠에서 투명한 유리 레티클로 노출시켰다. After post-exposure baking step, and reverse rotation of the wafer by exposure equipment (MICRASCAN II), to expose a transparent glass reticle at 10mJ / ㎠. 제 2 노출후에는 후노출 베이크 공정을 수행하지 않았다. After a second after exposure did not perform exposure bake process. 제 2 노출의 목적은 초기에 미노출된 레지스트를 웨이퍼로부터 제거하는 것으로, 현상후 네가티브 톤 레지스트 패턴만을 남겨 놓는다. The purpose of the second exposure is to remove the resist from the wafer minochul initially, it developed leaving only the negative tone resist pattern. 초기 상-방향 노출량은 17 내지 24mJ/㎠이고, 후노출 베이크 온도는 90초 동안 110℃이고, 현상 시간은 0.14N TMAH에서 100초였다. The initial phase-direction and the dosage is from 17 to 24mJ / ㎠, after exposure baking temperature is from 110 ℃ for 90 seconds, the development time was 100 seconds in 0.14N TMAH. 표준 네가티브 톤 레지스트를 유사한 형식으로 처리하였는데, 대조군으로서 블랭킷 노출 단계를 생략하였다. Were treated in a similar format for the standard negative-tone resist, the blanket exposure step was omitted as a control. 상기 실험으로부터의 전기적 데이터는 도 2와 3에 나타나 있다. Electrical data from the experiment are shown in Figure 2 and 3. 당해 분야에 공지된 표준 방법을 사용하여 계산할 경우, 표준 네가티브 레지스트에 비교하여 혼성 레지스트에서 약 0.11㎛의 큰 등초점 인쇄 바이어스가 관찰되었다. When calculated using standard methods known in the art, a large deungcho dots printed bias of about 0.11㎛ resist was observed in the hybrid as compared with the standard negative resist. 본 발명은 특히 바람직한 예시적 실시태양을 참고하여 기술되었지만, 당해 분야의 숙련가에게는 본 발명의 취지와 범주를 벗어나지 않고도 전술한 내용에 형식과 세부사항에 대한 변화를 도입할 수 있음이 이해될 것이다. The invention will be understood that can be introduced into a particularly preferred exemplary changes refer to the sun and has been described, in the foregoing without departing from the spirit and scope of the invention for those skilled in the art to the form and detail. 본 발명에 의해 노출에 대해 포지티브 톤과 네가티브 톤 반응을 동시에 갖는 포토레지스트 물질을 제공함으로써 통상의 노출 시스템을 보다 높은 패턴 밀도에 적용할 수 있게하고, 웨이퍼 칩의 여백 폭에 대한 매우 정밀한 상 조절을 가능하게 하며 최소 레티클 구조물 크기를 완화시킨다. By providing a photoresist material having a positive tone and negative-tone reaction at the same time for the exposure by the present invention and can be applied to the conventional exposure system, a higher pattern density, high-precision phase control over the margins of the wafer chip possible and thereby reduce the minimum size of a reticle structure. 포토레지스트 조성물. The photoresist composition. 포지티브 톤 성분이 네가티브 톤 성분에 비해 후노출 베이크(post expose bake) 조건에 덜 민감한 포토레지스트 조성물. Exposure bake after the positive tone component as compared to the negative tone component (post expose bake) less sensitive photoresist composition to conditions. 제 1 화학선 에너지 준위가 제 2 화학선 에너지 준위에 비해 높거나 낮은 포토레지스트 조성물. A first actinic energy level is higher than the second actinic energy level or lower photoresist composition. 포지티브 톤 성분이 소정 농도의 용해도 억제제를 함유하는 수지를 포함하는 포토레지스트 조성물. The photoresist composition is a positive tone component comprises a resin containing a solubility inhibitor having a predetermined concentration. 용해도 억제제의 농도가 인쇄 여백의 폭을 줄이기 위해 증가되거나, 용해도 억제제의 농도가 인쇄 여백의 폭을 넓히기 위해 감소되는 포토레지스트 조성물. Or the concentration of the inhibitor increase the solubility in order to reduce the width of the print margin, the photoresist composition the concentration of the solubility inhibitor is reduced to widen the width of the print margins. 용해도 억제제의 농도가 네가티브 톤 라인의 등초점 인쇄 바이어스를 확대하기 위해 증가되거나, 용해도 억제제의 농도가 네가티브 톤 라인의 등초점 인쇄 바이어스를 줄이기 위해 감소되는 포토레지스트 조성물. 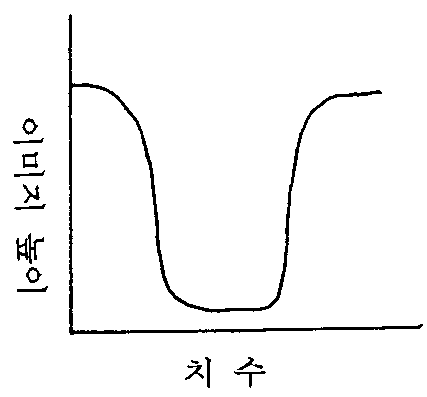 Or the concentration of the solubility inhibitor is increased to enlarge the deungcho point of the negative-tone printing bias line, the photoresist composition the concentration of the solubility inhibitor is reduced in order to reduce the bias of the negative-tone printing deungcho point line. 집적 회로 칩(integrated circuit chip)의 제조 방법. The method of the integrated circuit chip (integrated circuit chip). 필름의 노출 단계 후 현상 단계 전에 필름을 베이킹하는 단계를 추가로 포함하는 방법. After the exposure step of the film method further comprising the step of baking the film before the development step. 노출 단계 후 베이킹 단계 전에 필름을 저용량의 화학선 에너지에 블랭킷(blanket) 노출시키는 단계를 추가로 포함하는 방법. Blanket films before baking step after the exposure step to a low dose of the actinic energy (blanket) method further comprising the step of exposing. 베이킹 단계 후 현상 단계 전에 필름을 블랭킷 노출시키는 단계를 추가로 포함하는 방법. It comprises a film further step of blanket exposure prior to the developing step after the baking step. 베이킹 단계 후 현상 단계 전에 필름을 상(image)-방향으로 재노출시키는 단계를 추가로 포함하는 방법. After baking the film before the development step (image) - method further comprising the step of re-exposure to the direction. 노출량의 변화가 하나 이상의 라인 및 하나 이상의 여백의 크기에 대해 영향을 주지 않는 방법. How to change the dosage that does not have an impact on more than one line and the size of the one or more margin. 필름의 선택된 부분을 노출하는데 사용하기 위하여 여러 길이와 폭의 라인 및 여백을 갖는 레티클(reticle)을 선택하되, 레티클의 라인 및 여백의 폭 편차가 하나 이상의 라인의 폭에 영향을 주지 않도록 선택하는 단계를 추가로 포함하는 방법. For use in exposing a selected portion of the film, but select the reticle (reticle) having a line, and the margin of the various length and width, wherein the selecting so as not to affect the width of the lines and the width or more of the deviation is a margin line of the reticle the method further comprises. 두배로 된 빈도의 라인 및 여백을 갖는 레티클을 선택하는 단계를 추가로 포함하는 방법. Method further comprises the step of selecting a reticle with line and the margin of the doubled frequency. 제 1 화학선 에너지 준위가 제 2 화학선 에너지 준위에 비해 낮도록 포지티브 톤 성분 및 네가티브 톤 성분을 선택하는 단계를 추가로 포함하는 방법. A method of the first actinic energy level further comprises the step of selecting a positive tone component and a negative-tone components to be lower relative to a second actinic energy level. 제 2 화학선 에너지 준위가 제 1 화학선 에너지 준위에 비해 낮도록 포지티브 톤 성분 및 네가티브 톤 성분을 선택하는 단계를 추가로 포함하는 방법. The method further comprising the step of selecting a positive tone component and a negative tone component a second actinic energy level to be lower than that of the first actinic energy level. 네가티브 톤 성분에 비해 후노출 베이크 조건에 덜 민감한 포지티브 톤 성분을 선택하는 단계를 추가로 포함하는 방법. Then compared to a negative tone component method further comprises the step of selecting a less sensitive positive tone component on exposure baking conditions. 포토레지스트 조성물이 추가로 소정 농도의 용해도 억제제를 포함하고, 원하는 여백 폭을 수득하기 위해 용해도 억제제의 농도를 선택하는 단계를 추가로 포함하는 방법. The photoresist composition comprises a solubility inhibitor having a predetermined concentration, and additionally, the method further comprises the step of selecting the concentration of the solubility inhibitor in order to obtain the desired margin width. 노출 단계 동안 그레이-등급 필터를 사용하여 중간 노출 영역을 생성하는 단계를 추가로 포함하는 방법. It comprises using a filter rating the further step of generating an intermediate exposure region during the exposure step gray. 제 7 항 내지 제 19 항중 어느 한 항의 방법에 의해 제조된 집적 회로 칩. Of claim 7 to 19 Compounds of the integrated circuit chip manufactured by any one of methods. 제 20 항의 단계 후에 비트라인 층을 제조하여 생성된 6 스퀘어 절첩된 비트라인 (square folded bitline) 구조를 포함하는 집적 회로 칩. The sixth square the folded bit line of the bit line layer prepared by the steps of claim 20 after generating (square folded bitline) integrated circuit chips including a structure. 제 20 항의 단계 후에 축을 따라 비트라인 층 및 얕은 트렌치 격리 층(shallow trench isolation layer)을 제조하여 생성된 4 스퀘어 절첩된 비트라인 구조를 포함하는 집적 회로 칩. Claim along the steps of claim 20 after the bit line layer and a shallow trench isolation layer (shallow trench isolation layer) produced by the generation of a four-square folded bit line integrated circuit chips including a structure. 필름 형성 포토레지스트 조성물의 제조 방법. Method of producing a film forming a photoresist composition. 화학선 에너지 노출의 제 1 준위가 제 2 준위에 비해 낮은 방법. How the first level of actinic radiation exposure energy lower than the second level. 포지티브 톤 성분이 산 불안정 기에 의해 보호된 염기 가용성 수지인 방법. How the positive tone component of a base-soluble resin protected by an acid labile. 네가티브 톤 성분이 테트라메톡시메틸 글리콜우릴, 2,6-비스(하이드록시메틸)-p-크레졸, 메틸화된 멜라민 수지, 부틸화된 멜라민 수지, 메틸화된 글리콜우릴, 부틸화된 글리콜우릴로 구성된 그룹으로부터 선택된 가교결합제인 방법. The negative tone component tetramethoxy methyl glycoluril, 2,6-bis (hydroxymethyl) -p- cresol, with a methylated melamine resin, butylated melamine resin, methylated glycoluril, the group consisting of a butylated glycoluril the method of cross-linking agent selected from the. 필름 형성 포토레지스트 조성물이 산 불안정성 차단기 및 가교결합제를 갖는 수지를 포함하는 방법. It comprises a resin having a film-forming acid labile photoresist composition breaker and a crosslinking agent. 주형 용매의 첨가 전에 혼합물에 염기 첨가제 및 증감체를 배합하는 단계를 추가로 포함하는 방법. Method further comprising the step of blending a base additive material and a sensitizer in the mixture prior to the addition of template solvent. 광산 발생기가 N-(트리플루오로메틸-술포닐옥시)-비사이클로[2.2.1]헵트-5-엔-2,3-디카복스이미드, 오늄염, 방향족 디아조늄염, 술포늄염, 디아릴요도늄염, N-하이드록시-나프탈이미드의 도데칸 술포네이트, N-하이드록시이미드의 술폰산 에스테르, N-하이드록시아미드의 술폰산 에스테르로 구성된 그룹으로부터 선택되는 방법. The photoacid generator (trifluoromethyl-sulfonyloxy) - N- [2.2.1] hept-5-ene-2,3-dicarboxylic imide bokseuyi, onium salts, aromatic diazonium salts, sulfonium salts, diaryl method naphthalimide selected from the group consisting of a mid-dodecane sulfonate, sulfonate ester of N- hydroxyimino mid-sulfonic acid ester, N- hydroxy-amide-urinary salts, N- hydroxy. 주형 용매가 에톡시에틸프로피오네이트, 에톡시에틸 프로피오네이트와 γ-부티롤락톤의 조합물, 및 프로필렌글리콜모노에틸에테르 아세테이트로 구성된 그룹으로부터 선택되는 방법. How the template solvent is selected from ethoxy ethyl propionate, ethoxyethyl propionate, and combinations of γ- butyrolactone, and propylene glycol monoethyl ether acetate group consisting of a. 염기 첨가제가 디메틸아미노 피리딘, 7-디에틸아미노-4-메틸 쿠마린, 3급 아민, 양성자 스폰지, 베르베린, 중합체성 아민, 테트라 알킬 암모늄 하이드록사이드, 세틸트리메틸 암모늄 하이드록사이드로 구성된 그룹으로부터 선택되는 방법. Which base additive is selected from dimethyl-amino-pyridine, 7-diethylamino-4-methyl coumarin, a tertiary amine, proton sponge, berberine, polymeric amine, tetraalkylammonium hydroxide, cetyltrimethylammonium hydroxide group consisting of Way. 증감체가 크리센, 피렌, 플루오란텐, 안트론, 벤조페논, 티옥산톤, 안트라센으로 구성된 그룹으로부터 선택되는 방법. Decrease body chrysene, pyrene, fluoran is selected from X, anthrone, benzophenone, thioxanthone, the group consisting of anthracene. 단일 노출의 제 1 화학선 에너지 준위에 노출된 포토레지스트의 제 1 부분이 현상액에 불용성으로 추가로 되는 포토레지스트 조성물. The photoresist composition of claim 1, portions of the photoresist exposed to a first actinic energy level of the single exposure is to be further insoluble in the developing solution. 단일 노출의 제 2 화학선 에너지 준위에 노출된 포토레지스트의 제 2 부분이 현상액에 불용성으로 추가로 되는 포토레지스트 조성물. The photoresist composition of claim 2, portions of the photoresist exposed to a second actinic energy level of the single exposure is to be further insoluble in the developing solution. 제 1 준위와 제 2 준위 사이의 중간 범위의 화학선 에너지 준위에 노출된 포토레지스트의 제 3 부분이 광활성으로 추가로 되는 포토레지스트 조성물. A first level and the second photoresist composition is further a third portion of the photoresist is photoactive exposure to actinic energy level of the mid-range between the levels. 제 1 준위에 거의 노출되지 않고, 제 2 준위에 완전히 노출되는 포토레지스트 조성물. The photoresist composition is hardly exposed, fully exposed to the second level to the first level. NL8101200A (en) * 1981-03-12 1982-10-01 Philips Nv A process for applying a resist material on a substrate and resist material.